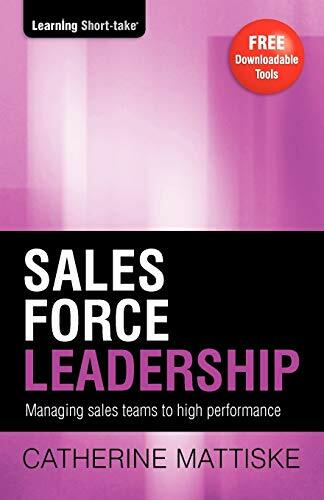 Sales Force Leadership: Managing Sales Teams to High Performance Sales Force Leadership combines self-study with realistic workplace activities to help you develop skills in key facets of sales management. It will guide you in evaluating your current sales management approaches and help you develop new and innovative approaches for application in the workplace. Sales managers are usually highly competent sales people who are often promoted on their technical skills and selling capability. Apart from product, service and sales knowledge, today's sales manager needs skills in leadership, coaching, counseling, planning, finance, business strategy and innovative ways of dealing with people management issues. By providing you with new, fresh methods in various facets of sales management, Sales Force Leadership will ultimately help you improve the success of your team and reduce the stress of a managing a sales team. Sales Force Leadership includes the Sales Meeting Planner, Sales Meeting Plan Summary, and the Sales Planning Worksheet, provided as free downloadable tools.